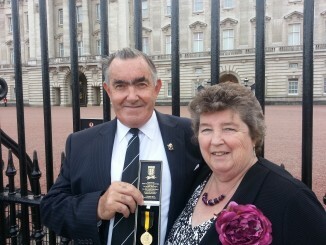 Will Hoskings pictured with wife Rosemary after receiving the FA Grassroots Heroes award at Buckingham Palace. Prince William has presented a Football Association award to Will Hoskings of Goonhavern in recognition of his outstanding contribution to the game. Will was one of 150 volunteers in England – and the only one from Cornwall – selected to receive the special Grassroots Heroes honour in celebration of the FA’s 150th anniversary. Ever since his playing days – 1962 to 1971 – as a full back and centre half for Goonhavern FC he has been heavily involved in organising local football. Elected Club Chairman in 1990, he played a key role as one of the members who acquired the previously nomadic team’s permanent home at Reen and developed its club house and facilities between 1991 and 1996. His commitment extended to carrying out much of the actual building work. In 2008, after 18 years as Chairman, he volunteered to take the post of Club Secretary which he holds to this day. For the Cornwall County Football Association (CCFA), which organises football in Cornwall on the FA’s behalf, he has also played important administrative roles. In 2003 he became Vice Chairman and in 2004 General Secretary of the Jolly’s Mining League. In 2010 he helped in the restructuring which combined the Mining League and Falmouth & Helston League to form the Trelawney League, in line with the FA’s policy of creating a pyramid system to feed into the higher leagues. He continues as General Secretary of the Trelawney League, with its 92 teams in six divisions, and is on the Disciplinary Committee of the next tier – the Cornwall Combination League. Will’s dedication to the local community has seen him serving as a parish councillor from 1979 to 2000 and, going further back, working on committees which set up the Goonhavern Youth Club and Goonhavern Park in the 1970s. A leg amputation in 2009 put an end to his active participation on the pitch as a linesman but this has not dampened his enthusiasm. On top of his administrative tasks, he is regularly found at Goonhavern FC’s club house helping in any way he can – which often means frying chips or serving drinks after matches. Tags: Football Association, Goonhavern, Grassroots Heroes, Mark Nicholson Copywriting, press release, Will Hoskings. Bookmark the permalink.